COLUMBIA, Mo. ­— The “Big ‘M’ of the Midwest,” University of Missouri’s Marching Mizzou, is raising awareness and funds for the ALS Association by competing against the university’s biggest athletic rival, the University of Kansas, as part of a fundraising campaign called Marching for Hope. Marching Mizzou has raised nearly $10,000 for the ALS Assocation as of Nov. 22, with an ultimate goal of $30,000. Each of the nearly 300 band members has a personal fundraising webpage with an individual goal of $200. The fundraising competition will cumulate on Nov. 27 at the Mizzou-Kansas 2010 Border Showdown football game at Arrowhead Stadium in Kansas City. Marching Mizzou will dedicate its half-time performance at that game to those living with ALS. Bradley Snow, the director of Mizzou’s athletic bands, says the band members are always enthusiastic about competing against KU, but ultimately the goal is to raise money for ALS. Marching Mizzou has raised more than $6700 for the ALS Assocation as of Nov. 15, with an ultimate goal of $30,000. Snow said when the Marching Mizzou members learned about ALS, it was a sobering experience. Laurel McCoy is a junior at MU and plays clarinet with Marching Mizzou. She has raised more than $270 by requesting donations from Facebook friends and e-mailing friends and family. Marching Mizzou is one of 21 college marching bands nationwide participating in Marching for Hope. The campaign benefits the ALS Association, a nonprofit organization that provides services to patients and funds research of amyotrophic lateral sclerosis (ALS), also known as “Lou Gehrig’s Disease.” The association estimates that as many as 30,000 Americans live with the progressive neurodegenerative disease. 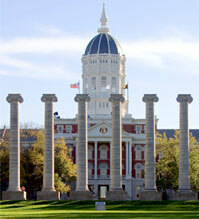 The Marching Mizzou members’ fundraising webpages and progress can be viewed online at http://web.alsa.org/uofmissouri.